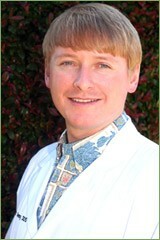 Dr. Denny was born and raised in the South Bay. After graduation from Peninsula High School, he pursued his undergraduate studies at California Polytechnic University in San Luis Obispo, where he received his Bachelor of Science degree in Biological Sciences. Thereafter, he attended and graduated from the University of the Pacific School of Dentistry in San Francisco. While in dental school, he completed several hospital-based externships in Oral and Maxillofacial Surgery, General Dentistry, and Removable Prosthodontics. After graduation, Dr. Denny returned home to the South Bay working as an associate in Carson. The son of Robert W. Denny, an orthodontist and Karen Denny, a registered dental hygienist, Dr. Denny was exposed to the ins and outs of dentistry at a very early age. In fact, his first job was making retainers at his father's practice in Torrance. Dr. Denny is not the only one of his siblings to continue in the "family business." His sister, Mary, is a general dentist in the San Francisco Bay Area; his brother, Trevor, owns a dental practice in Santa Barbara; and his younger brother, Cabot, is a denist providing orthodontic services at his father's office. When he is not working, Dr. Denny can be found spending time and traveling with his wife, Katrina, who ironically first met her now father-in-law when she was his patient at just 11 years old. Trina and Garrick attended high school together and were married in September 2007. Her parents, Lynn and Mike Walker, live in the South Shores area of San Pedro. As his friends, family and patients will attest to, Dr. Denny has a friendly disposition and is extremely easy going. He strives to provide the highest quality of care to his patients and to make a difference to the people's lives in the area that he has called home for so many years. Dr. Denny and his team thank you for choosing their practice for your dental needs and look forward to helping you achieve your goals for many years to come...they are here to make yours the best dental experience possible.